Are you unhappy in your corporate job? Maybe you own your own business and everything is going great, but you’re still unhappy. 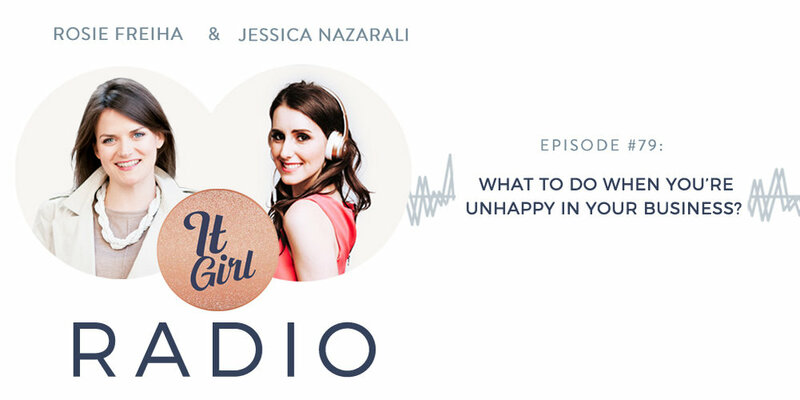 Tune into this episode of It Girl Radio to hear Rosie Freiha’s story and find out what to do when you’ve found success but still aren’t happy. We are programmed to go to a university and then eventually get a job. Most of us turn to the corporate world, like Rosie did. But, like many, Rosie’s job wasn’t fulfilling and it led to a host of health problems. The stress and hours of the job ended up hurting her physically and mentally. Maybe you are feeling the same way right now in your job but don’t know how to get out of that rut you are in. In this episode, Rosie shares her journey from following all the rules, attending university, working in the financial sector and then branching out, breaking free and starting her own business, “Living Rosie.” But it wasn’t everything she hoped it would be, and after moving to Beirut, she started feeling unhappy again. Eventually, Rosie found happiness when she began a coaching brand under her name. Rosie talks about what to do when a situation like this arises and how you can start your own satisfying business. Rosie helps you understand what to do when you have success but you aren’t happy. Her strategy includes being self-aware and figuring out what you really want out of life. It’s okay not to know right away. In this episode, she helps you understand how to figure it out, discover how you want to be seen in the world and then set your goals for achieving it. Rosie shares her journey with us on how being self-aware and listening to yourself can create something great. This podcast is great for those who need an extra push to leave the constraints of their corporate life. Break free from the chains and give this podcast a listen! Start your new journey today! (1:25) How did Rosie end up being the woman/coach she is today? (15:01) How do you start navigating when you have success, but you aren’t happy? (19:05) How can you make yourself happier?